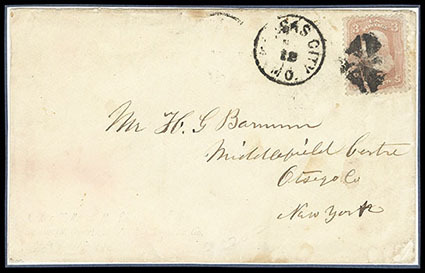 Adams & Co's Express, Columbia., wonderful strike of blue oval handstamp with manuscript date Sept. 26 on buff cover to San Francisco, Extremely Fine and choice. 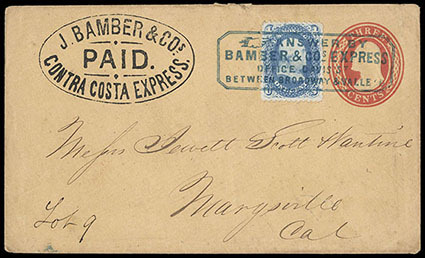 Bamber & Co.'s Express, genuine oval frank on 3¢ Nesbitt entire to Marysville, with 1¢ added and tied by forged blue Bamber directive handstamp, Extremely Fine appearance. Bamber & Co's Express, printed frank at left of legal-size 12¢ red & brown on buff mint entire, Very Fine; with 2018 P.F. certificate. Scott No. U42 Estimate $200 - 300. Barlow, Sanderson & Co. 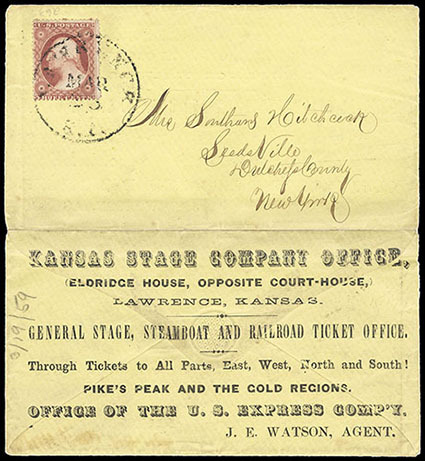 The Great Southern Overland Mail & Express Co., letter datelined "Kansas City May 11 1866" from T.J. Barnum, a partner of the firm regarding its creation to his brother reading in part: "…Who ever heard of an old stager to quit untill he had to. I am in to for four years more when I hope to give up this wild life and stay at Home…I shall be in New Mexico Arrizona & Probably California as we have got the Great Southern Overland Mail & Express from the Missouri River to San Diego - the largest but one in the United States. The firm is Barlow Sanderson & Co. Your humble servant myself is the Co. thats where the joke comes in but I am the youngest Partner & the name is long enough so it won't do to cover the Stage all over with letters…", accompanied by original cover bearing 3¢ rose (65) tied by circle of wedges duplexed with "Kansas City Mo. May 12" cds to his brother at Middlefield Centre N.Y., Fine. Barlow, Sanderson & Co./C. & O. 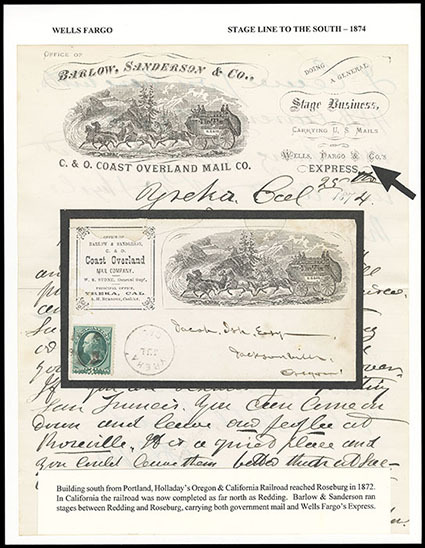 Coast Overland Mail Company/Principal Office,/Yreka, Cal., Printed corner card on cover to Jacksonville, Ore. with illustrated design showing Six Horse Stage on Mountain Road, Stage with "Overland U.S. Mail/B.S. & Co." imprint, cover franked with 3¢ green Bank Note tied by quartered cork cancels with Yreka, Ca. cds alongside, included is matching letterhead, "Doing a General Stage Business, Carring U.S. Mails and Wells, Fargo & Co.'s Express", cover with couple tears at top, F.-V.F., a spectacular & rare item. Established by Vermont men, Jared L. Sanderson and Bradley Barlow during the Civil War, the Barlow-Sanderson Overland Mail Company first carried the mail and operated a stage line between Sedalia and Warrensburg, Missouri and by 1863, was also operating a line from Kansas City, Missouri to Fort Scott, Kansas. In 1866, they began to expand westward and transferred their headquarters from Kansas City to Junction City, Colorado. By 1867, the two entrepreneurs had established a route from Missouri to California over the Santa Fe Trail and changed the name to the Barlow and Sanderson Company. The company continued to grow in Colorado, becoming the largest stage line in the area and in 1874, the headquarters moved to Granada, Colorado. Two years later, despite rumors of bribery and corruption within the company, the stage line continued to expand. However, by 1878, Bradley Barlow withdrew and the name of the company changed to J.L. Sanderson and Co. Overland Stage and Express Line. 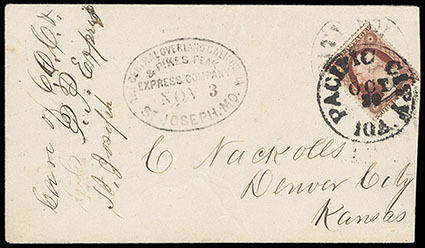 The Central Overland California & Pikes Peak Express Company, St. Joseph, Mo., Nov 3, clear oval handstamp on cover bearing 3¢ dull red (26) tied by bold "Pacific City Ioa., Oct 30" to Denver City Kans., endorsed "Care of C.O.C. & P.P. 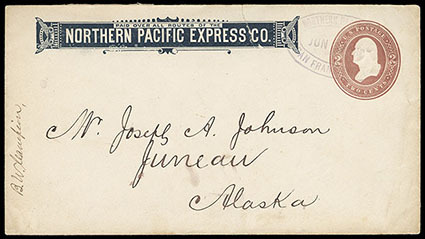 Express, St. Joseph" at left; reduced at right and slightly cleaned, Fine and scarce use; with 1987 P.F. certificate. 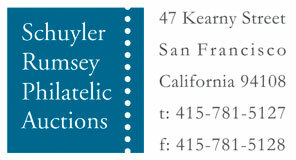 This firm was a part of the western freighting operation of Russell, Majors & Waddell. t was a precursor of the Pony Express, later operated by the same firm from St. Joseph to California. The COC&PPE was running between St. Joseph and the gold mining regions of the Rocky Mountains in what is now Colorado, since there was no mail route. Before Kansas became a state in 1861, this part of the front range was a part of Kansas Territory. Eldbridge Brothers' Express, Kansas Stage Company Office, ornate all-over advertisement in several typefaces on reverse of yellow cover bearing 3¢ dull red (26) tied by "Lawrence, K.T. Mar 23" cds to Leedsville N.Y., pencil 1859 docketing; cover split for display and hinged together, otherwise Very Fine and unique. THE ONLY RECORDED EXAMPLE OF THIS STUNNING ELDRIDGE BROTHERS KANSAS EXPRESS DESIGN. There are three different illustrated designs associated with the Eldridge Brothers' Express. 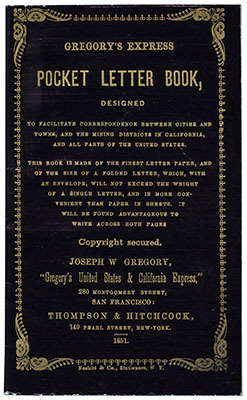 Gregory's Express "Pocket Letter Book", unused 1851 gold on black glazed letter book, Thompson & Hitchcock imprint, printed by Nesbitt & Co., with original buff envelope, Extremely Fine and choice. 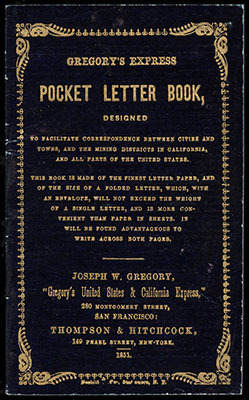 Gregory's Express "Pocket Letter Book", unused 1851 gold on black glazed letter book, Thompson & Hitchcock imprint, printed by Nesbitt & Co., with original slightly worn buff envelope, Very Fine. Northern Pacific Express, Jun. 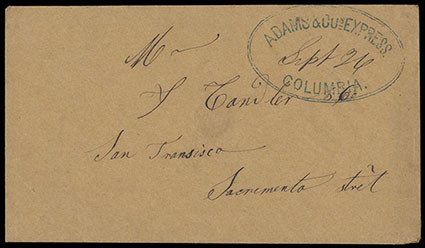 17, 1887, San Francisco, violet oval handstamp on 2¢ brown entire with dark blue company frank addressed to Juneau, Alaska, sealed cover tear at top affecting frank, Fine and rare.